Let's face your interview with confidence because our app wil give you some tips and tricks to help you to achieve your goals. 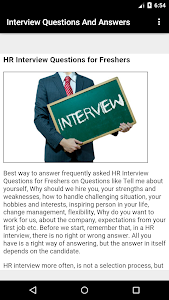 -Interview Questions Answers for Freshers. 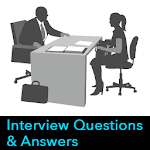 -Interview Questions Answers for Experience candidates. 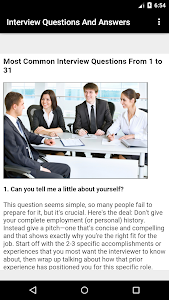 - Useful guide to crack your interview. - You can easily share it with your friends,relatives using what's app,twitter,Instagram,Facebook. - Hello how are you today ? - What are your key strengths ? - what are your weaknesses ? - Where do you see yourself in 5 years from now ? - Have you been in some challenging situation ? Explain how you handled it ? - Why should we hire you ? - What are your hobbies and interests ? - Who is the most inspiring person in your life? - Are you willing to change your role and profile when required for project? - Are you flexible with timings if have to work in shift ? - Do you wish to pursue higher education? - What is one thing that you like about our company? - What are your expectations from your first job? - Do you have a referral in this company? Kindly give us your rating and feedback.And feel free to give us any suggestions. Similar to "Interview Questions & Answers"